This morning our pastor, Jen Howat, preached on Acts 1:1-9. Her sermon focused on how we are called to BE the church, which means doing the work of Jesus & not necessarily gathering in church buildings. 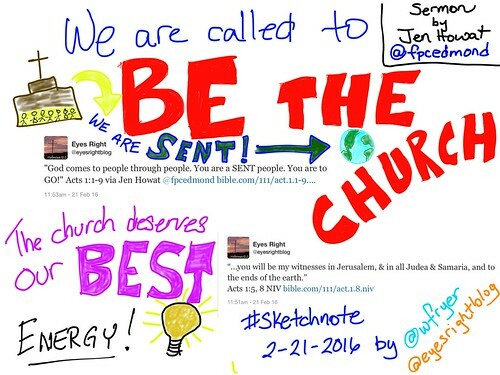 This is my sermon sketchnote and narrated sketchnote of her sermon. I integrated a couple tweets which I shared during the first part of the sermon.